No one cared about the artistic value of the Alexander III monument, when it was removed by Bolsheviks. When country witnessed the fall of the Soviet Union 20 years ago, it also witnessed the fall of its monuments. The general impression was that it is observing something unique and unusual. But the tendency to destroy old symbols and build new ones is as old as humanity. When the Bolsheviks came to power in 1917, the first thing they did was to start destroying monuments to the tsars and replace them many times over with monuments to Communist revolutionary heroes. One of the first victims of this campaign was the great monument to tsar Alexander III, which was removed from its pedestal on Ploshchad Vosstaniya. 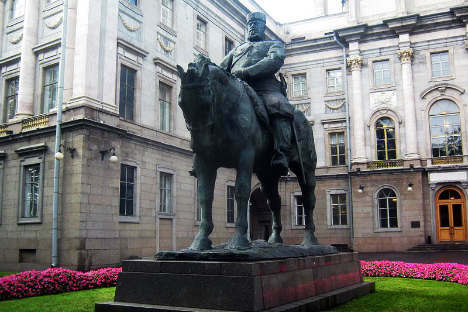 No one cared about the artistic value of the monument, no one cared that it was made by Paolo Troubetzkoy, arguably the best sculptor of Russian impressionism. Luckily, the monument was not destroyed, and is currently placed at the entrance to the Marble Palace in St. Petersburg. The issue of the old and new monuments in the post-Soviet space has attracted a lot of media attention. One of the most interesting countries in terms of the "war of monuments" is Ukraine, where old and new values identified in the monuments continue to collide. Germany offers another example. After its unification in 1990, Germany did not destroy or remove its Soviet monuments. Most of the monuments of the Soviet past remain in place because Germany underwent a significant historical re-evaluation of itself, and it made legal obligations to protect the monuments to the Red Army warriors. At the same time, you can see portraits of Adolf Hitler in German museums, which does not provoke pro-Nazi moods in society. In addition, a large memorial complex to the victims of the Holocaust reflects a general mood of reconciliation within German society and its past. That makes Berlin a unique place, where you can see the remains of all regimes that existed on German soil — the Weimar Republic, East Germany, the Third Reich — and the historical recored remains largely uncensored. But not everything is this rosy in Germany. The war of monuments has touched the country, and the discussion about whether to remove the monument to Karl Marx and Friedrich Engels has started in the German capital. Poland is a good example of a country where new values replaced old ones. Poland's monuments to Soviet marshals and generals were removed and replaced by monuments to John Paul II, victims of communism and the Katyn massacre. Marian Konieczny, a famous Polish sculptor, said in a recent interview that today Poland has more monuments to the Pope than it had to Stalin in the 1950s. In November, I saw a photo of the unveiling ceremony of the monument to former U.S. President Ronald Reagan in Warsaw. This seemed to be one more indication that new heroes are replacing the fallen ones. Poland has clearly made its choice regarding its values and its chosen path. But there is one exception to this tendency. In the small Polish town of Poronino, where Lenin spent some time before the 1917 Revolution, the monument to Lenin, which was first destroyed in 1989, was renovated in 2010 following a decision by the local authorities. When asked for the reason, the mayor of Poronino said, "It is the only way we could attract Russian tourists and their money." But events elsewhere did not always take place as smoothly as in Poland. The 2007 decision in Estonia to remove a monument to a Soviet soldier — the Bronze Soldier — sparked a wave of protests from the Russian-speaking community and caused street riots in Tallinn. Similarly, the unveiling of a new monument to Stepan Bandera, the controversial leader of the Ukrainian nationalists in the 1930s and 1940s who cooperated with the Nazis, sparked a heated conflict in Lviv between those opposed to the monument and local activists who were on a 24-hour alert to protect their national hero. In 2010, Georgia destroyed the monument dedicated to soldiers who perished in the Great Patriotic War with Nazi Germany between 1941 and 1945. The moment was designed by the famous Georgian sculptor Merab Berdzenishvili, who was well-known in the Soviet Union. The strongest protests were heard from Russia — above all, from government officials. Russia even suggested that the whole complex be removed to Moscow, but the monument was blown up by Georgian officials before this plan could be enacted. Much of the monument debate focuses on whether a monument is a work of art or merely an artifact. This issue never seems to goes away. Take, for example, the 2006 exhibit in Schverin of Arno Breker, Hitler's favorite sculptor. Or the exhibits of Lev Kerbel, who erected monuments to Lenin worldwide. Can it be said that the artistic quality of monuments erected after the fall of communism, such as many monuments to John Paul II, are genuine art or merely symbols of change in history? In my opinion, the popularity of sculptor Zurab Tsereteli is symptomatic of post-communist Russia. It also reflects the country's imperial past and traditions that the scale of a monument has become more important than its artistic value. The problem of the war of monuments in such countries as Ukraine and Russia is complex and controversial. At the same time, it seriously undermines the value of the monuments, their public and artistic value and largely devaluates the monument as a piece of art. In the end, Russians show much more interest in harmless monuments with no political or historical controversy — for example, the monument to a loyal dog in Tolyatti, the Chuzhik-Pyzhik sculptor of a tiny bird in St.Petersburg, where people of all ages flock to make a wish, or traditional cultural monuments like the Pushkin monuments in Moscow and St. Petersburg. Then there is the planned monument to vodka or the sculpture in Ulyanovsk devoted to Russians' favorite letter in the alphabet — "Ё." People have much more support for these types of monuments than they do for political figures. Perhaps this captures their attitude toward monuments better than anything else.